It was the eighth inning and the game was in hand. A blistering hot Sunday afternoon and the $10 beers were only cooling down our wallets, so I asked my wife if she had enough. 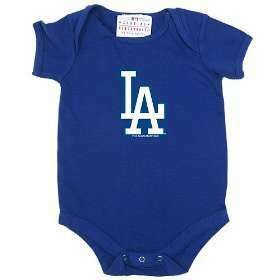 If the Dodgers go on an extended playoff run, I’m going to have to squeeze my kid to fit into this in a month. See, she likes baseball and enjoys the competition aspect of sports in general. Whereas I can watch almost any baseball game anytime. And sometimes do. Suzanne isn’t a Dodgers fan so she cringed as I bought a Dodgers onesie for my daughter. Shortly after I purchased the new baby item, the Dodgers went on a 42-8 run that was one of the best 50-game stretches in baseball history. When they hit a skid and hadn’t clinched a playoff spot yet, I put the onesie on Ella and they won that night, the first team in baseball to secure a postseason berth. While I might not be as good looking or as wealthy as David Beckham, I can take my daughter to a Dodgers game. And you’re damn right she’ll be rocking a Dodgers pacifier. Yes, we have worked sports superstition into our daily lives. So it is with great anticipation that I get to dress my kid up in a Dodgers onesie on Thursday and sit down with her and watch the Dodgers’ playoff game. Like so many before her, my daughter has been transfixed by Vin Scully’s voice. She loves watching baseball. Or, maybe she just likes the colors and moving pictures of a TV screen. No, no, it can’t be that. She loves baseball. Yep, that’s it. While I know she is going to crawl all over me and drool all over her Dodgers onesie and cry for food at some point, I’m excited to sit and relish the experience of father-daughter bonding over a sports event. Even if Suzanne will have to take pictures of it to prove it to her in a few years that it actually happened. And whether or not we continue to watch sports together or end up having pinked-out tea parties every Sunday during fall so there is no way to watch football, it’s all about spending time together. Maybe, just maybe, she’ll be the one dragging me to games one day, or texting me about the latest score. And if not, maybe I’ll have to be the one texting her about ice dancing or the latest Enya album. It’s just all about creating that bond. That’s what I’m most looking forward to. Next Who’s Really Crying It Out?